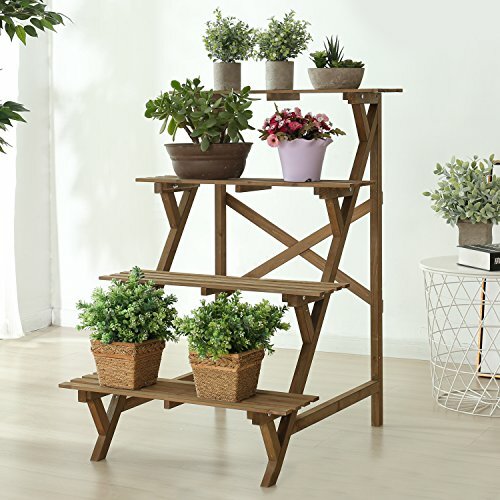 Thoughtfully tiered to provide space to display potted plants in a lush cascade, this 4 level wood plant rack has a rustic look that lends itself to use in the greenhouse or in the home. The 4 shelves are slatted to drain quickly when used outdoors, making this rack ideal for deck or patio adornment. Used indoors, the staircase arrangement creates a dramatic setting for a collection of photographs, curios, or indoor succulents. Approximate Dimensions (in inches): Overall - 37 H X 25 W X 28.75 D. Each Shelf - 25 W X 7 D.
A versatile shelf rack made of wood featuring 4 tier slat shelves. Ideal for use inside your home or outside on your deck, patio, porch or greenhouse. Perfect for storing and organizing potted plants, books and other items throughout your home.